Ever wonder what electronic dance music icon Diplo was like behind the scenes? The trailer for a new Viceland series “What Would Diplo Do?” might give you an idea. “What Would Diplo Do?” is Viceland’s first scripted comedy series. It stars James Van Der Beek as a fictional version of international DJ superstar Diplo who may have millions of fans, but who can’t seem to keep up with his personal relationships. He also seems to be trying too hard to keep up in the electronic dance scene. In one part of the trailer, in a quest to find a new sound, he and his crew put a violin in a blender. “There’s no ‘I’ in team bro,” says one of his crew, played by comedian Bobby Lee. “Yeah but there’s an ‘I’ in Diplo,” he responds. It’s unclear if any of Diplo’s real-life co-collaborators will show up for “Entourage”-style cameos, but we can hope. If you’re thinking that this concept comes out of nowhere, Van Der Beek has parodied the artist before. For the popular DJ’s annual Mad Decent Block Party concert tour in 2016, the “Dawson’s Creek” star channeled his inner Diplo diva. The show is executive produced by Van Der Beek and the artist himself Diplo, along with TMWRK’s Kevin Kusatsu and Brandon Dermer, who also directs. Content studio Matador also produces the series. “What Would Diplo Do?” premieres on Aug. 3. Watch the trailer above. 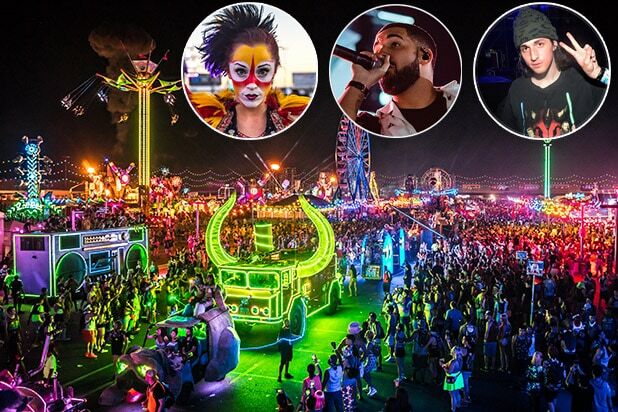 The 21st Electric Daisy Carnival, the largest dance music festival in North America, took place outside Las Vegas this weekend. Costumes, neon and bass drops were expected. Drake (center), who dropped in as huge surprise, was not. The Kinetic Field main stage was rebuilt from scratch this year, dubbed "Kinetic Gaia." Illuminating the intersection of nature and technology, the most popular and mainstream artists like Tiesto, Dillon Francis, Hardwell and trance legend Armin Van Buuren played here. One totem-toting fan in the crowd at Metro Boomin's midnight set on Sunday must have been tipped off about the rap royalty about to appear. "(Metro Boomin) brought me to space for a night," Drake said of his virgin voyage to EDC. The stage he appeared on, Basspod, is about the fifth largest stage, making his appearance a total shock. Drake sang "Fake Love" and "Jumpman." At the same time that Drake was turning up, Lil Jon was singing "Turn Down for What" at the Circuit Grounds. Lil Jon required no introduction. He just showed up on stage and started directing the mosh pit before spitting out "Prison Riot," his collaboration with Flosstradamus. Standout performance No. 1: Porter Robinson. The young ambient producer, who killed with a sunset timeslot on Coachella's mainstage back in April, brought his hour to a crescendo with "Shelter," "Goodbye," and "Language" as fireworks lit up the speedway on Saturday night. Standout performance No. 2: Alison Wonderland, Diplo and Jauz performed together as a trio for the first time ever, a world exclusive on Sunday night. The three artists performed a "b2b2b" set, which stands for "back-to-back-to-back." They traded songs on the same decks. Standout performances No. 3 and No. 4: K?d (pronounced "kid", left) and Rezz (22, from Niagara Falls, right) are two of the faces of the future. “EDC, this is the biggest crowd I’ve ever played to,” Rezz said. She snapped this selfie with k?d backstage. Insomniac's "Ground Control" team had a roll call meeting on Friday night. This trained team of peer volunteers keeps fans, dubbed "headliners," healthy, happy, and hydrated. The festival preaches about their free, plentiful, no-questions-asked, no-police-involvement, emergency medical services on site. Ground Control are the ambassadors who look out for anyone in need. "All are welcome here," was the theme for EDC 2017. Unlike other festivals, EDC goers are a community. This year, they scheduled countless meet-ups, housing-shares, resources for solo-travelers, and brought their own bracelets and merchandise to give out, largely fueled by an active EDC subreddit. Don't forget about the "Carnival" part of EDC. Photographer Rebecca Britt caught the Zipper ride in action. From 135,000 attendees on Sunday night, there were only four DUI arrests and three traffic accidents reported. There were no traffic fatalities, per the Las Vegas PD. Performers and VIPs flew in to the Speedway on Maverick Helicopters, skipping the traffic. Online, guests complained about 90-120 minute drives in to the festival in what was 100-degree heat. Note: For sanity, this six minute chopper is worth every penny of the $850 round trip ticket. Tropical house star Kygo had never played EDC before this weekend. He started at the top: main stage. L.A. based producer Valentino Khan ("Deep Down Low") and Austin-based Bro Safari both played the Basspod stage. The festival runs from dusk-til-dawn, but there was no avoiding the heatwave. At 8 p.m. on Sunday it was 104 degrees. By midnight, it was only down to 96. Insomniac stressed the need for hydration on their social media channels and through the festival app. Exhibit B: This meme comes from the "Adult Swim" show "Rick and Morty". Exhibit C: The fidget spinner. Swedish duo Galantis rocked the Circuit Grounds until 3 a.m. on Friday night. In addition to their arsenal of sea fox flags, they worked under 2,000 moving lights, 40 flame units and 1,200 pyro units. Over 200 singles became 100 legally married couples at EDC. One guy proposed on the main stage before Kygo's set. Lowlight: The enduring popularity of saccharine rave bro Marshmello is concerning. His fans showed up in force and in costume. On the other end of the festival from the Marshmell-bros, philosophically and geographically, the Neon Garden pumped out three nights of slower builds with experimental and more underground techno. Widely credited as the "Adam" of hardstyle genre, The Prophet spun the Wasteland stage. Let's call the hard-hitting electronic analog to death metal an "acquired taste." The “#LoveWins” heart installation was a frequent Instagram photo spot. Smirnoff commissioned the artwork and surrounded it with plush seating while promoting their take on the message of inclusivity and love. Every night around 11 p.m., the main stage Kinetic Field would erupt in an "opening ceremony." "Thank you for all that you do for dance culture," fan @StefAmoroso (right) posted to Instagram upon running in to EDC founder Pasquale Rotella amongst the crowd around 6 a.m. on Monday morning. "Thank you for creating a place where we can be free and not be judged."